Forty participants, parents and professionals, from ASP Luzon Chapters attended the second Speakers’ Training last February 27, 2010. Held in the Asian Social Institute in Malate, Manila, the training seeks to equip ASP Leaders in continuing nationwide education program for SM Supermalls’ front liners. 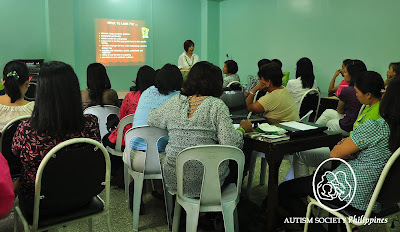 “This training is to ensure a pool of effective ASP speakers for public orientation on autism. ASP prides itself in having customized and personalized presentations,” explained Ranil Sorongon, ASP Executive Director. ASP’s much sought-after speaker and Chair Emeritus, Dang Koe, generously shared her expertise and experiences as an “enter-trainer.” She immediately brought the house down with her “less-than-20-second self-introduction” and set the tone for a fun-filled lecture in the morning. “The Speaker's Training is a great and helpful tool for us neophyte speakers. The training encompassed everything from the preparation of the talk, to its opening salvo; content and how to end the talk,” said Lyn Borja, wife of ASP Marikina Chapter’s VP. Dang emphasized on having clear objectives and knowing the audience profile. During the afternoon workshop, each participant was assigned to deliver a 15-minute talk for critiquing. They were divided into 6 smaller groups. On hand to assist as Group Moderators were ASP Trustees Carmel Almendrala and Gina Bermudo; ASP Bacoor Chapter President, Jan Peña; Teachers My Sorongon (ASP Education Committee Member) and Kismette Cepe (ASP Bacoor Chapter) and Ranil. “The workshop is informative and I had a very fruitful day. I just wished we had more time to prepare our speeches and materials ” reported Jacky Garcia, ASP Molino President. Dang closed the day by reminding the participants that effective presentations will result to more families getting loving smiles and looks of understanding from more mall employees. “I’m inspired by Dang’s delivery of message. Every detail is very clear and easy to understand. I hope to start on my new career - to be a great speaker! I will keep my fingers crossed, wish me luck” kidded Hilda Fajardo, VP of ASP Bacoor Chapter. ASP would like to thank the 40 participants for attending the seminar and Ms. Johanna Alexis Naing, who volunteered in documenting the training. ASP continues to work hard in training ASP Chapter Leaders. We continue Sharing Hopes and Building Dreams for a brighter tomorrow. Take the giant leaps with us. 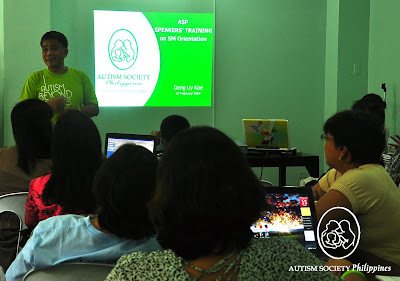 To request for Speaker’s Training Seminar in your area write us at autismphil@pldtdsl.net or call us at 9266941 / 9298447.